A savory stew of old time music with a pinch of bluegrass and a dash of original songs and tunes. A regular feast of fun, toe tapping simple music played by complicated people. The Wronglers are Bill Martin on Mandolin, Krista Martin on fiddle, and Nate Levine on guitar, and assorted friends that join them in their now rare, but always lively, public appearances. 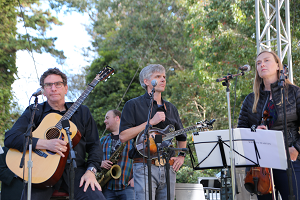 First formed about 15 years ago, the Wronglers included Warren Hellman, founder of the Hardly Strictly Bluegrass Festival. The Wronglers were lucky enough to have played HSB for the past 10+ years, and have performed at the Freight and Salvage, the Arc, Passim, Prairie Home Companion, The Station Inn, the SF Free Folk Music Festival, and other great venues of folk and Americana music.